Gutted with foreclosures during the downturn, Orlando’s vacation-home market is making a comeback with big-name homebuilders rolling out neighborhoods of six-, seven- and eight-bedroom pool homes. The new line of vacation homes differs from those built during the pre-recession days, because cheaper land prices now allow builders to spread out the vacation hacienda with fully equipped houses and townhomes in traditional-looking neighborhoods. In years past, developers stacked up floors of two- and three-bedroom condominiums in order to sell more units and cover the higher land costs. Another factor driving the new, amped-up vacation homes is an increase in South American visitors to Central Florida, who tend to travel with extended family and who are interested in investing in income-producing rentals, developers say. Prices typically range from the low $200s for townhome-style units to the high $400s for more expansive, detached houses. Orlando’s visitor volume reached 59.2 million last year, up 27 percent from 2009. International visitor traffic increased 45 percent to 4.8 million, according to the Orlando Convention and Visitors Bureau. Strickler said the Orlando area still gets its share of European tourists who travel in smaller numbers, but more tourists are coming from Brazil, Venezuela, Argentina and Colombia – and those vacationers often prefer staying at a house with plenty of room for the entire family to relax. In addition, increasingly popular websites marketing vacation homes have popularized trips based at a house instead of a hotel. HomeAway.com, Airbnb.com and VBRO.com are among the specialty sites that book houses, allowing searches by bedroom count and the number of people who can sleep in a house. Even travel-booking service Expedia.com recently began offering vacation homes as an option to hotels. Buyers can still face the struggle of finding property managers who adequately vet short-term renters, keep the property in good shape and don’t overcharge. Kissimmee property manager Nigel Worrall, who has written several books on vacation rentals, cautioned buyers to steer clear if they cannot cover most of the mortgage costs themselves, or at least half of the payments. When the housing market crashed starting in 2007, the vacation-rental market was hit particularly hard with investors walking away from mortgages as the amount of visitors to the region slowed. Orlando-area vacation-home rentals have been slower to emerge from the recession than hotels because many of the second homes were “less than ideal” vacation properties and ultimately fell into foreclosure, said Steve Trover, chief executive officer of All-Star Vacation Homes in Kissimmee. During the last year, the market has shifted. The combination of increased demand and more affordable land prices has drawn Pulte Homes, KB Home, Minto Communities, Lennar, Beazer Homes and Park Square Homes into the mega-house vacation-rental scene after years of construction standstill. 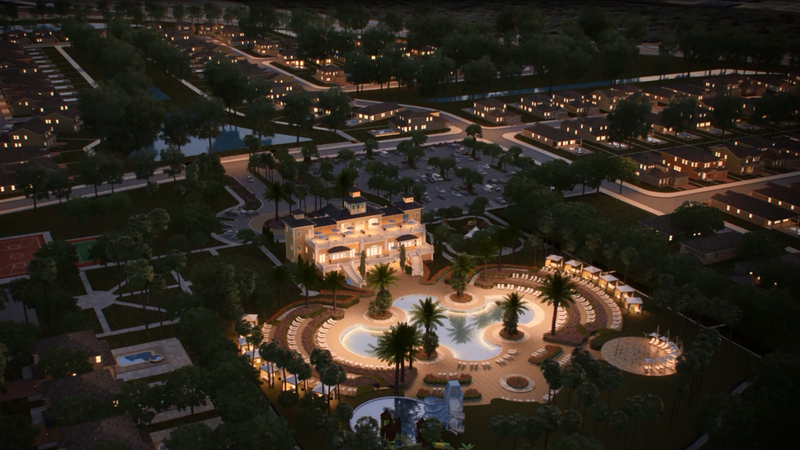 Pulte announced plans last month for its Windsor at Westside community off U.S. Highway 192 in the Kissimmee area. For $475,000, buyers can get nine bedrooms and six bathrooms in a single-family house outfitted with a private pool, granite finishes, stainless-steel appliances and tile roof. Minto recently purchased 200 acres southwest of Celebration and is underway on the Festival community of 500 townhomes, which will have as many as five bedrooms and optional “pass-through” doors connecting two units. “Tourism is up and the propensity for buyers to come to Orlando is greater than ever. Now you see larger numbers of guests who like to share entertainment space,” Minto Communities Senior Vice President William Bullock said. Even though the first models are not slated to open until March or April, Minto has been marketing Festival at buyer trade shows – primarily in Europe and South America.